Group photo of all volunteers who met at Winton Park. Tucker said there were 13 church/groups represented this year, which included Grace Community Church, Calvary Fellowship Church, Family Worship Center’s Project Purple, Kings River Conservancy, Tenaya Middle School Wildlife Club, Sanger High LEAP Program Community Service Club, Sanger Boys & Girls Club, Orange Cove Boys & Girls Club, Sunset Waste Systems, Starbucks, Fairmont 4H and the Church of Jesus Christ of Latter-Day Saints Helping Hands. The refuse and recyclables were deposited in containers provided by Sunset Waste Systems and the group or organization who collected the most debris received a $75 prize from Sunset Waste Systems. Sonia Lara-Tyler, Recycling Coordinator for Sunset Waste Systems said, “So far, it looks like we’ve got a lot more people…more so than last year I believe,” when describing the number of participants in the event. 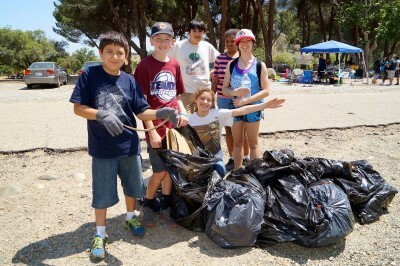 Tenaya Middle School Wildlife Club collected the most trash and was the winner of the $75. Tanaya Middle School Wildlife Club members show off all the bags of trash and recyclables they collected. The actual date for Earth Day was, Monday, April 22, but the clean up group was celebrating it on the Saturday prior to Earth Day to include a larger and more varied volunteer group. 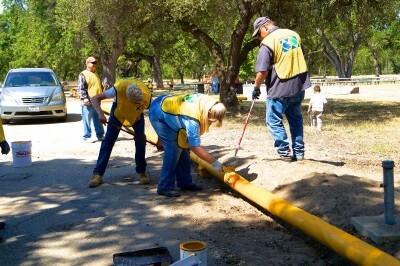 Most of the volunteers met at Winton Park on the Kings River, where they were given project options to work on. Projects included painting benches and planting trees at Choinumni Park, picking up debris in rafts floating down the Kings River, picking up refuse along the shoreline of the river, working on a nature trail within Winton Park, and joining the Church of Jesus Christ of Latter-Day Saints Helping Hands with the rehabilitation of the group picnic area at Avocado Lake. Church of Jesus Christ of Latter-Day Saints Helping Hands volunteers paint and remove weeds at Avocado Lake group picnic area. Once volunteers decided on what project they wanted to work on, there was transportation provided to them to get to their destinations. Trash bags and bottled water were provided for the volunteers during the clean up. After the clean up, there was a barbecue lunch provided by Sunset Waste Systems. According to Lara-Tyler, there were 300 hot dogs, 300 bags of chips and 300 bottles of water provided. In addition to the hot dogs, 40 pounds of chicken drumsticks, donated by Pitman Farms, were cooked up as well. Kings River Conservancy provided volunteers with directional maps and information about the Kings River to assist them with their clean up projects, along with fun activities for kids. 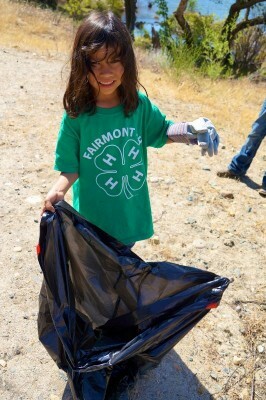 Macie Richardson, one of the seven Fairmont 4H volunteers, picking up trash along the Kings River shoreline. Returning to donate time for the river clean up was a group from Starbucks. Vanessa Robles from Starbucks traveled from Bakersfield to participate in the clean up. Robles, along with fellow Starbucks volunteer, Diana Rascon, painted benches and planted trees at the Choinumni Park. “Everybody should volunteer in the community around them. It’s important to help out,” said Rascon. “Everybody benefits from the community taking care of each other,” added Robles. Both Robles and Rascon said volunteering was a great way to show young adults and children, by example, the importance of volunteering and keeping the Earth clean. Debbie Mobley, District Manager with Starbucks said there were a total of 20 volunteers from Starbucks this year. Tucker said partnering with the Mormon Helping Hands this year was done to make a bigger impact. All projects took place at the same time. 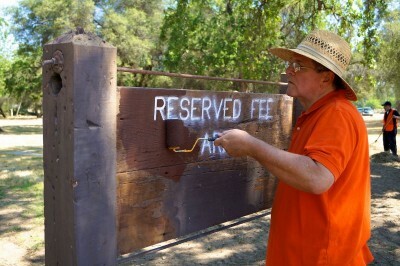 Bill Short, Helping Hands coordinator, paints the sign designating the Avocado Lake group picnic area. The group painted four water storage tanks, painted red curbing, weeded the picnic area, painted benches, and also had boats out picking up trash. Short said the Helping Hands project was part of a larger national event with other Helping Hands groups volunteering all over the nation. “We look for opportunities to serve the community,” said Short. This was the first year for members from the Sanger Family Worship Center’s Project Purple group and the Calvary Fellowship Youth Program to participate in the clean up. “This is our third year, and it continues to grow,” said Tucker. “I think we are incorporating more, with learning about the river as a natural resource and as a place for us to go and enjoy.” Tucker also said the river clean up was important because the Kings River was in Sanger’s back yard. The Sanger Boys & Girls Club won first prize in their recent phone book recycling challenge. “We’re very proud of them,” added Lara-Tyler. Fresno County Boys & Girls Club representatives pose with Sanger Boys & Girls Club members in front of the bounce house, at the clean up event. 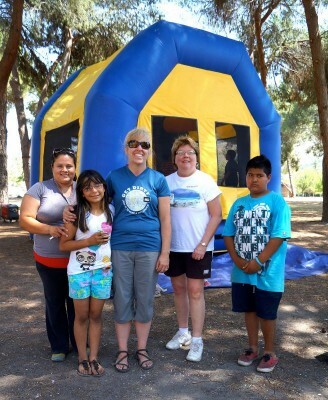 L to R - Orange Cove Club Director Rebecca Martinez, Angelina Garcia Aguirre, Sanger Club Unit Director Tammy Tucker, Fresno County Boys & Girls Club Executive Director Diane Carbray and Rafael Rodriguez. According to Tucker the clean up is going to take place every Earth Day and Lara-Tyler said Sunset Waste Systems is committed to working with the Sanger Boys & Girls Club. “We’ve always worked well together with them, so we want to continue that relationship with them,” said Lara-Tyler, who also said Sunset wants to celebrate Earth Day with all the communities they service. Items collected during the clean up included a lawn chair, food wrappers, beer bottles, soda cans and straws. Terrific work by all concerned, especially the young ‘uns. I love getting the Kings River Life Magazine emails in my Inbox! Way to go, guys. My fave: THE CAT HOUSE ON THE KINGS! It is so sweet that so many people are involved in cleaning up the river. It is import to teach the importance of providing services to the community and most importantly, to your home. Thanks so much for sharing!